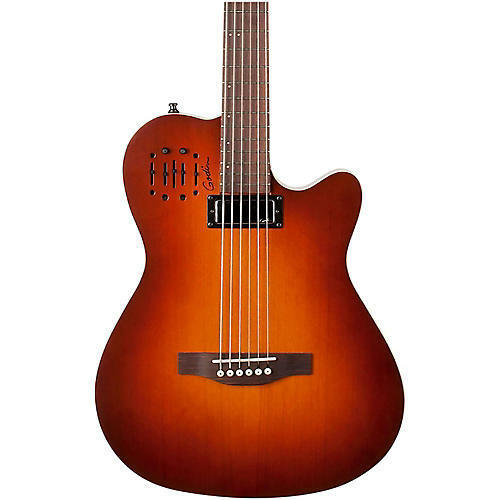 Godin's A6 Ultra Baritone continues with the innovative concepts found in all Godin A-Series guitars, such as combining amazing plugged-in acoustic sound with the feel of an electric neck, along with a chambered body design that virtually eliminates feedback in live and loud settings. These features stand true and better than ever in the A6 Ultra Baritone with the added "oomph!" and full tone of a Godin mini-humbucker in the neck position, along with an undersaddle transducer, dual outputs (acoustic and electric) that combine for a huge sound. The custom Godin preamp section is voiced specifically for the A6 Ultra Baritone. This preamp section gives a player the chance to control their tone via sliders for acoustic volume, treble, mid, bass and independent controls for the electric humbucker volume, treble and bass.